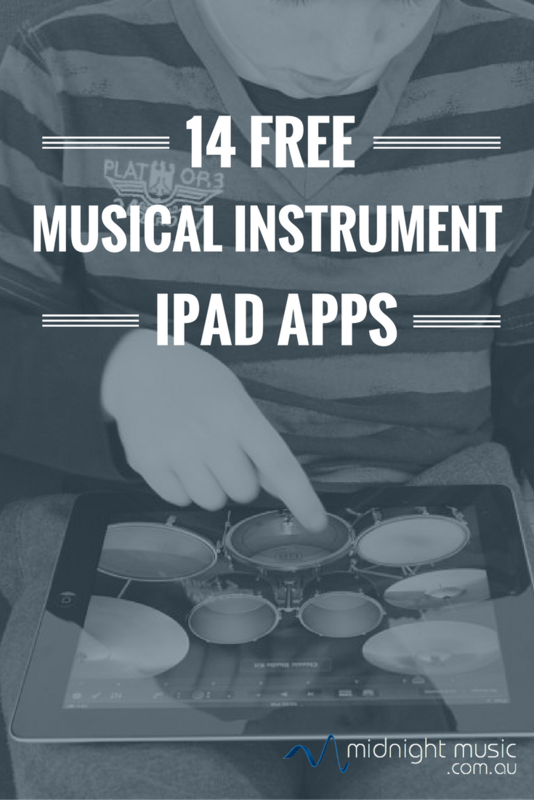 In the second part of my 5-part series about free music iPad apps (following on from 19 Free iPad Apps for Musical Creativity), we take a look at musical instruments. Before we start, let me just say that I do not advocate playing an iPad instrument when playing the real thing is an option: nothing can replace the feel and the sound of playing real, live instruments with other real, live musicians. However, there are times when iPad instruments can come in handy: when you can’t afford to buy the real thing, when you want to experience an unusual instrument that you’ll never purchase for your music department (zither anyone? ), when one student needs to play 10 different instruments for a class project and you only have the space for…well, for one iPad, or when you need 25 students to all play simultaneously in the same classroom and iPads with headphones make that possible. 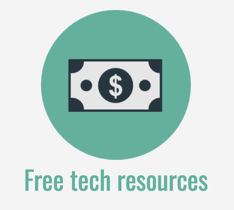 As mentioned in the first post in this series, paid apps are nearly always better than free ones but you might find a few gems below. Be warned that some include ads (often with the option to remove them for a fee) and some have limited capabilities. 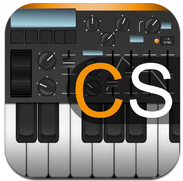 Great synth app that allows you to create your own loops using up to 4 instruments. Control velocity and add filter sweep effects while playing the keyboard. Tweak parameters of each preset to make your own sounds. You can create drumbeats using overdub and quantise features and balance levels using the mixer. 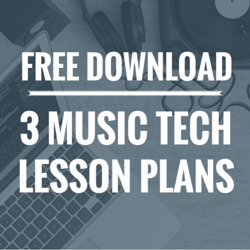 Includes sample songs that demonstrate the possibilities of the app and a link to an excellent Youtube demo/tutorial video. Also includes support for Audiobus. 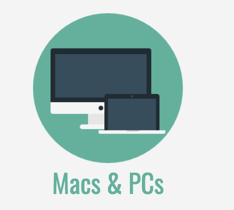 The Pro upgrade includes extra sounds and loops, pitchbend and allows you to save and export MIDI or audio. Nice, simple synth app that was used by the Gorillaz on their album The Fall. It has a decent number of presets – 40 in total – includes modulation and pitch bend wheels and you can adjust the delay and distortion settings. 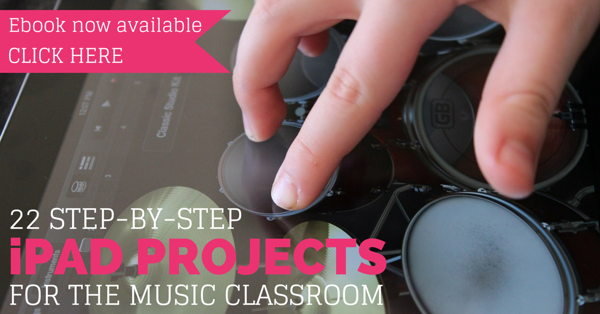 There’s also a sampler included so you can create your own sounds from scratch. This keyboard app has the option of displaying a single or double keyboard. The double keyboard makes it possible to play notes with the left and right hands at the same time in different octaves. 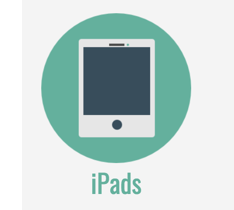 You can switch on two-player mode which flips one of the keyboards around, allowing two students to play on one iPad at the same time, opposite one another. It’s possible to adjust the size of the keys, allowing you to fit more keys on the screen (which will also be smaller in size). 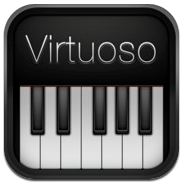 Includes just two sounds – grand piano and broken pub piano – and is one of the only keyboard apps I’ve seen that allows you to turn on (or off) labels that identify each note. 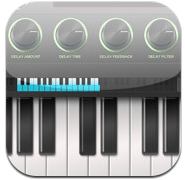 Nice little monophonic synth app that has keys that light up when pressed. You can edit the attack, delay, sustain and release in the volume envelope settings and it also includes a low pass filter module. There are two octaves and the app includes ads. 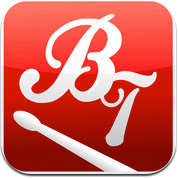 Upgrade to the paid version for 7 octaves, ad removal and many extra features. A drum kit plain and simple. Includes 3 backing tracks for you to jam along with. 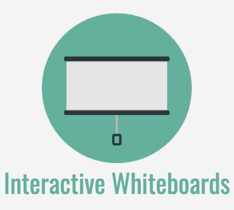 Useful for displaying on a data projector in order to show students the parts of a kit. 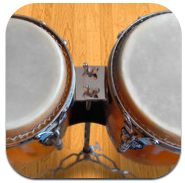 18 different sampled conga sounds that you can access by playing different regions of each conga on the screen. Includes a cowbell and drum stick sounds. 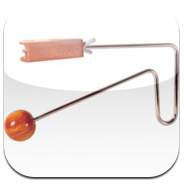 Used in the Northpoint Christian iPad Band’s Feliz Navidad video, this vibraslap takes advantage of the iPad’s built-in accelerometer: shake or tap the iPad to play. The creators of the app warn you to use the shake option with caution: “Please keep in mind to hold your device securely as we will not be responsible for lost or damaged hardware”. 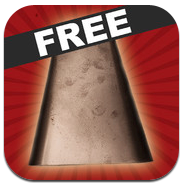 I’m not sure about the “awesome” bit, but this app features three cowbells of varying sizes and each has two tones. You can record your cowbell performance and play it back as a loop. This app includes ads. 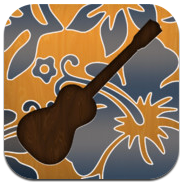 Nice-looking ukelele with a Hawaiian pattern. Play chords by pressing one of the chord buttons while you strum your finger along the strings. 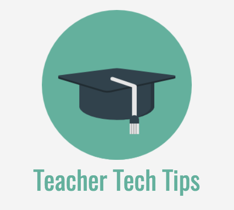 The chord buttons can be edited: tap the information button and then set up a chord sequence for a known song – using up to 12 chords – in the correct order. 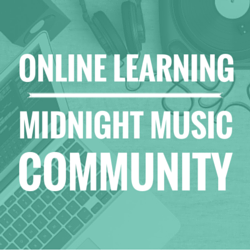 A library of user-created songs can be accessed to save you time programming your own songs. Includes ads. Play this ancient Indian instrument by touching your finger on a string, or sliding it horizontally along the string to add vibrato. You can play along with songs from your iTunes library and there’s an auto mode if you’d like to hear a demonstration. Includes a recording function that you can access by leaving an app rating in the iTunes store. Also includes ads. 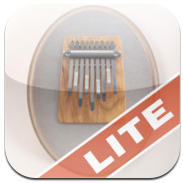 A simple kalimba instrument app which you play by touching the darkened ends of each metal strip. You can listen to some audio samples and upgrade to the paid version for access to different scales/tuning. Who doesn’t need a zither? Touch and slide your finger on the screen to create music. 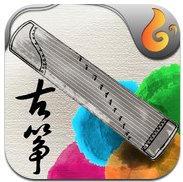 This app is rather beautiful to look at – it features a background of Chinese paintings which change while you play. You can play using the solo mode, or turn on song mode and be guided through a known song note-by-note. 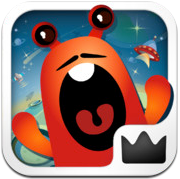 The app to download when you need an octave of monsters on the moon. Play the monsters by tapping on each one. In addition to the octave of monsters, extra “surprise” monsters of varying pitches pop out of moon craters. You could use these for an ear-training activity with young students – listen to the surprise monster and then try to find his matching monster in the one-octave line-up. A sampler lets you can record your own sound and play it back. 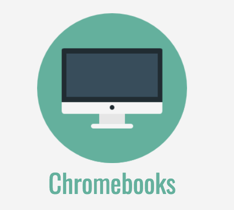 Includes an option to purchase songs that you can play along with. Turn off ads in the app’s settings area. Novelty value only! 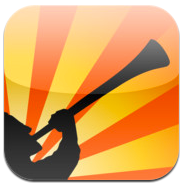 Tap on the screen or blow into the iPad microphone (yes, really) to play your vuvuzela. Sliding your finger along the vuvuzela will play a B flat-A glissando and if you place 4 fingers on the screen, multiple vuvuzelas will play at once. Hi, I’m a Finnish Music game / app developer with Mubik Musical Puzzle & Quartet Game Music apps. 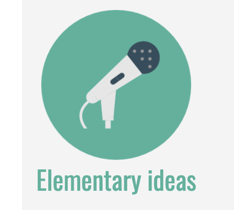 They can also be used in classroom situations as easy-to-play instruments for elementary schools. Please our our YouTube -videos, e.g. http://youtu.be/Qj5qfdTUuUo. Also, check our Facebook Group for further info! We’d love to hear feedback From You! Hello Ilkka – thanks for sharing this. I’ll take a look! 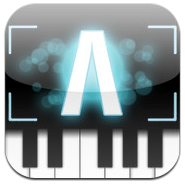 The latest best app for making music is Cadenza. 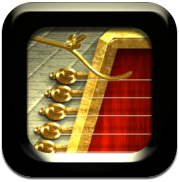 Unlike any other app, you just play your instrument while Cadenza listens to you. It accompanies you with real orchestra music synchronized to your playing in real time. 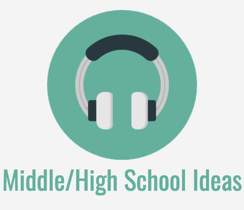 Hi Katie, I am looking for an app that would allow students to input their own compositions (stick notation) and it plays the melody back to them. Choice of sounds would be a plus. Do you know of any that are kid friendly? Obviously Sibelius or similar would do it for adults, but too much info for young children.